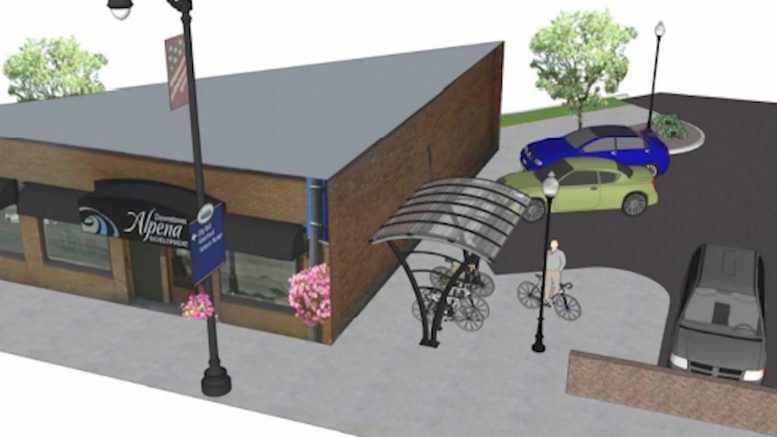 (Photo Courtesy/Alpena DDA) This is a rendering of one of the bike shelters next to the DDA office off of Chisholm St.
Mike Beiermeister and Mayor Matt Waligora discuss the possibility of new bike shelters in the downtown. At the last city council meeting, city council looked over a plan to install two bike shelters in the downtown area. The goal is to help keep bikes out of main sidewalks. Members questioned the price tag on the project among other things. The city has budgeted $25,000 for the project with the Alpena Downtown Development Authority offering up $10,000. The city will cover the rest of the cost. Right now, the project has a price tag of just over $17,000.